The Paramotor: Your Personal Aircraft! 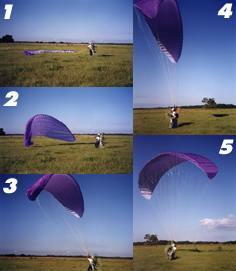 Paramotoring is the newest and latest development in ultralight foot-launched air sports. The entire aircraft will actually fit in the trunk of your car! This is an exhilarating yet simple way to aviate, also being the easiest powered aircraft you can learn to fly. With minimal training by aviation standards, you can enjoy the incredible experience of flying anytime the weather is calm. The small, lightweight engine drives a propeller and the entire unit is strapped to your back with a harness that allows you to fly beneath a standard paragliding wing. Combining a paraglider with a backpack engine allows you to fly from level ground, without the need for hills, mountains, wind, thermals or a tow rope. Foot-launching and landing also allows you to operate on virtually any type of terrain, such as wet sand, tall grassy fields, bumpy and rocky slopes, or anywhere else that using a wheeled aircraft would be impossible. 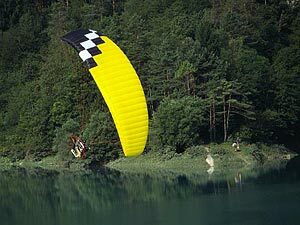 Paragliding itself has developed into a popular aviation sport in the last 12 years. It has its roots in hang gliding, but without the rigid structure, being easier to learn, lighter in weight, and most importantly can be carried in a backpack. Canopy design over the last couple of years has seen an amazing amount of progress, combining higher performance with increased safety. Paragliders are typically flown from a hill or mountain, with the pilot seeking lift to stay aloft for a 'soaring' flight. Without the rising air produced by thermals or wind deflecting off the ridge, the glider and pilot simply descend slowly until reaching theground. Towing with a winch will also allow pilots to gain altitude briefly, but the lift must still be found to maintain altitude for an extended period. With the paramotor disconnected, you can use your wing with a standard harness to fly from hills, ridges or mountains, joining the thousands of people who already enjoy this unique sport throughout the world. Paramotoring, or powered paragliding (PPG) is absolutely the most accessible form of aviation available to the public.These motors are the most powerful, yet low maintenance aircraft engines you will find. They are rugged, reliable and easy to use. There is no easier way to fly than paragliding, and with the addition of the paramotor, well, the sky is not the limit - it's the destination! Almost anyone can learn to fly a powered paraglider. However, a degree of physical fitness and mental awareness is required. It is really quite easy to fly, but you are still aviating. The pilot's attitude to safety and airmanship is key for an accident free flying career. There's an old saying in aviation: "There are old pilots, and there are bold pilots, but there are no old, bold pilots!" You must learn to become a proficient with a paraglider before putting on a paramotor. To safely fly a powered paraglider, we recommend that you take the time to learn the basics, and you will live long enough to enjoy your powered paraglider for many years. Most PPG schools will start with learning how to control the paraglider on the ground as well as in the air. Inflation techniques, kiting the wing, launching, turning, controlling the airspeed, approach and landing are all skills that you will need to master. Once you have mastered the basic skills, it's time to put on the power! Your instructor will familiarize you with the paramotor powerpack: assembly, disassembly, preflight, starting, throttle control, power cutoff, fuel/oil mixing, maintenance, torque and thrust effects, special dangers, transporting and storage. In about a week of paragliding and paramotor instruction, most students are ready for extended flights with their very own powered paraglider. Your trusted instructor will teach you everything you need to begin aviating safely and enjoyably.